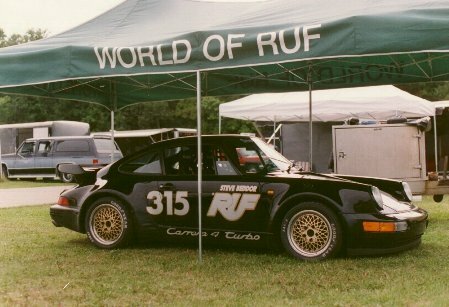 Above is Steve Beddor and his Ruf Carrera 4 Turbo (CTR). 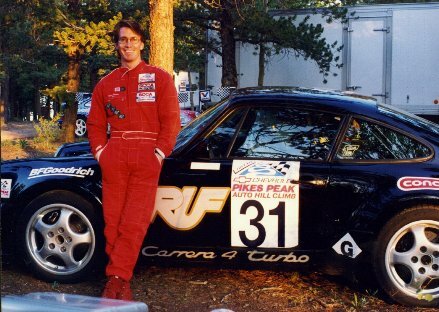 Back during the early 90's, when Steve became involved in racing the Ruf CTR in various club and autocross events, a tradition of record-breaking and race winning began which has yet to cease. With Steve comes Ruf, and with Ruf comes winning. Although the Ruf CTR and CTR2 are both street automobiles, they consistently out perform racecar-driving competitors. Events such as One Lap of America, and the Virginia City Hillclimb prove to be perfect settings to race the Ruf cars. And, at Pikes Peak, the stock Ruf street cars race in the "open" class for fully modified rally vehicles. What do the losers think when a street car beats their full-fledged racecars? But while the CTR was a fast one and won Steve many races, the new CTR2 Sport was debuted this year.